Hey guys! We visited the Interior Design Show yesterday (which was awesome.) It really inspired us to get started on some new projects. I am still compiling all my pics and will have an inspiration post up for you in the next couple of days. The entrance to the Storefront is level with the street. 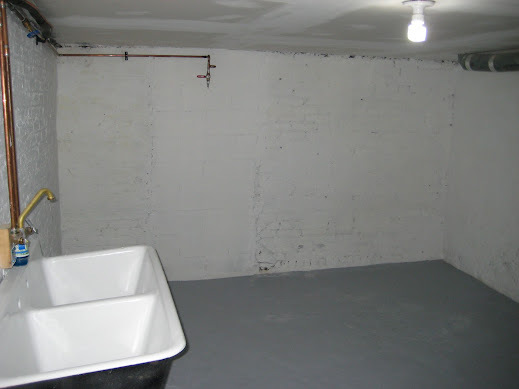 What that means for our basement is that it is completely underground and has no windows. At all. Most basements at least have some tiny windows. Not our house. Our basement is dark, damp, and the ceilings are about 6 1/2 feet tall. Basement before we moved in, before the reno, before the water damage, and when there was still a strange toilet hanging out in the middle of nowhere… Now this part of the basement is storage for a lot of misc. stuff. Couldn’t we just dig out the basement and make it nicer/finished? We could, but that would be expensive and hard. We could never have any windows, and a room without windows is just a bit sad. It would make a good dungeon, but a family room or guestroom? Not a chance. So…what will become of our basement? 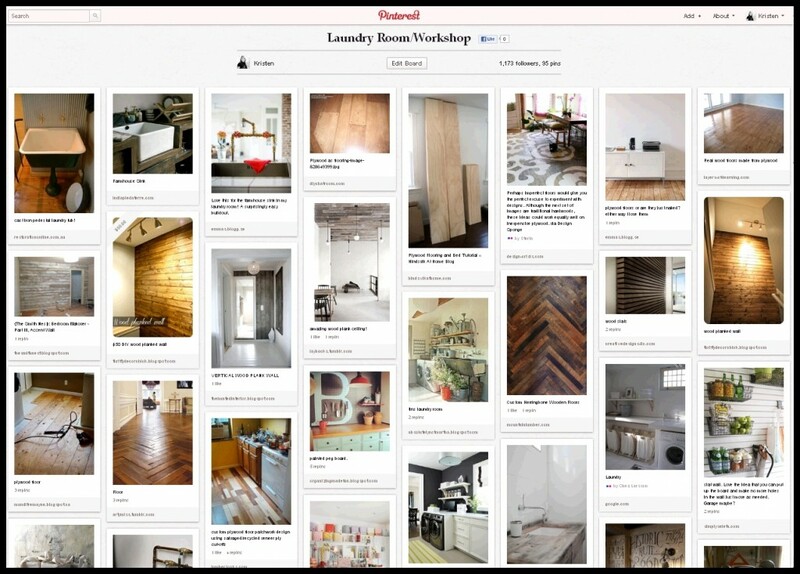 Realistically, it can be some storage, a laundry room, a maybe a workshop. You wouldn’t want to spend HOURS working down there, but its warmer than the garage in the winter, and a good place to keep craft/DIY supplies. 1/3 of our basement is already drywalled on the ceiling in the laundryroom area. We’re thinking of adding the workshop to that room, and then using the rest of the basement as storage/utilities. What do we need to do to get it in shape? Install a Dricore subfloor to allow any moisture that does get in, to get to the floor drain. Figure out what to do with the brick dust that the foundation bricks shed regularly and give the bricks some sort of finish (they have been previously painted but are flaking and yellowing from the water damage from a flood last year). 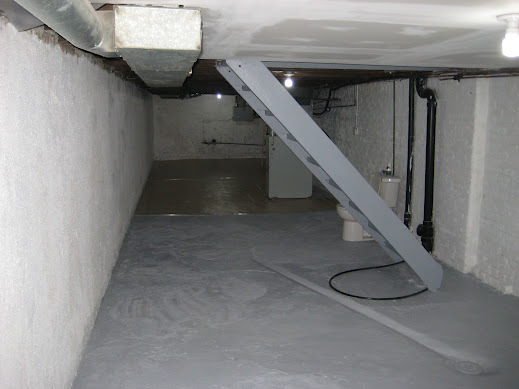 I am thinking a breathable basement/masonry paint. Install the awesome laundry bases we have had sitting in boxes for the last year. 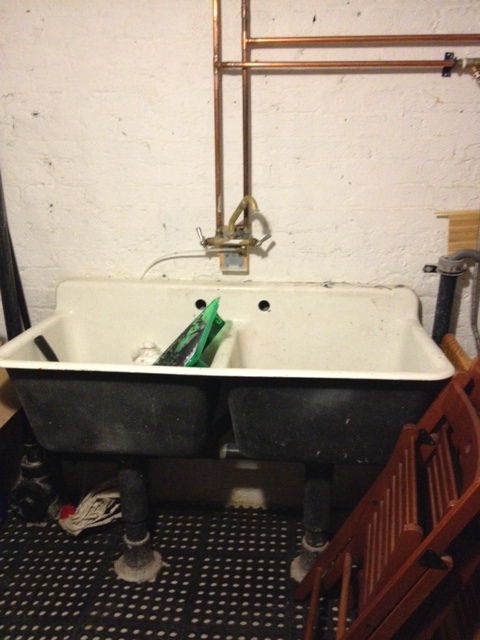 Scrub our original cast iron utility sink, and refinish the outside of it. It’s beautiful, but has seen better days after the reno and copious amounts of paint brushes being washed in it weekly. Adding a counter of some sort to stop socks from plummeting to their death behind the dryer. Also a good spot to stack folded clothes etc. So that post was almost exactly a year ago, and guess what we’ve done to remedy the situation? Everything in that post holds true. We have not improved the floor, the light, or the storage, and the spider population is increasing exponentially. Where does that leave us? Well its late January in a very cold Toronto. My garage is freezing, and I’m getting antsy to DIY. I miss the smell of sawdust in my nose, or paint in my hair. I need to be wearing ripped paint stained jeans, a giant hoodie, and some earplugs. 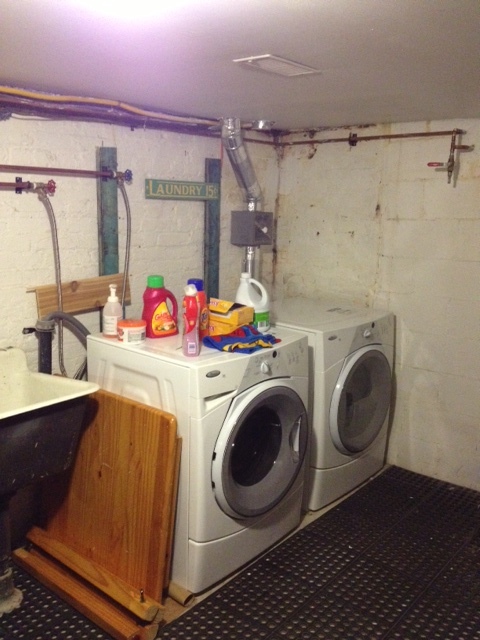 So I decided it was time to take on the great big project of our basement laundry room/crafting workshop. Am I crazy? Absolutely! Is it nice and toasty warm in the basement? YES! So its decided, I am turning the sad, sad space into a pretty, useful space that I wont dread using. NOW. Where do I start? Anyone? Anyone… Bueller… Bueller?